by Edwards, C. Henry; Penney, David E.; Calvis, David T.
For introductory courses in Differential Equations. 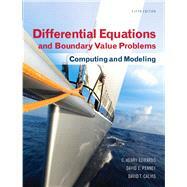 This best-selling text by these well-known authors blends the traditional algebra problem solving skills with the conceptual development and geometric visualization of a modern differential equations course that is essential to science and engineering students. It reflects the new qualitative approach that is altering the learning of elementary differential equations, including the wide availability of scientific computing environments like Maple, Mathematica, and MATLAB. Its focus balances the traditional manual methods with the new computer-based methods that illuminate qualitative phenomena and make accessible a wider range of more realistic applications. Seldom-used topics have been trimmed and new topics added: it starts and ends with discussions of mathematical modeling of real-world phenomena, evident in figures, examples, problems, and applications throughout the text. C. Henry Edwards is emeritus professor of mathematics at the University of Georgia. He earned his Ph.D. at the University of Tennessee in 1960, and recently retired after 40 years of classroom teaching (including calculus or differential equations almost every term) at the universities of Tennessee, Wisconsin, and Georgia, with a brief interlude at the Institute for Advanced Study (Princeton) as an Alfred P. Sloan Research Fellow. He has received numerous teaching awards, including the University of Georgia's honoratus medal in 1983 (for sustained excellence in honors teaching), its Josiah Meigs award in 1991 (the institution's highest award for teaching), and the 1997 statewide Georgia Regents award for research university faculty teaching excellence. His scholarly career has ranged from research and dissertation direction in topology to the history of mathematics to computing and technology in the teaching and applications of mathematics. In addition to being author or co-author of calculus, advanced calculus, linear algebra, and differential equations textbooks, he is well-known to calculus instructors as author of The Historical Development of the Calculus (Springer-Verlag, 1979). During the 1990s he served as a principal investigator on three NSF-supported projects: (1) A school mathematics project including Maple for beginning algebra students, (2) A Calculus-with-Mathematica program, and (3) A MATLAB-based computer lab project for numerical analysis and differential equations students. David E. Penney, University of Georgia, completed his Ph.D. at Tulane University in 1965 (under the direction of Prof. L. Bruce Treybig) while teaching at the University of New Orleans. Earlier he had worked in experimental biophysics at Tulane University and the Veteran's Administration Hospital in New Orleans under the direction of Robert Dixon McAfee, where Dr. McAfee's research team's primary focus was on the active transport of sodium ions by biological membranes. Penney's primary contribution here was the development of a mathematical model (using simultaneous ordinary differential equations) for the metabolic phenomena regulating such transport, with potential future applications in kidney physiology, management of hypertension, and treatment of congestive heart failure. He also designed and constructed servomechanisms for the accurate monitoring of ion transport, a phenomenon involving the measurement of potentials in microvolts at impedances of millions of megohms. Penney began teaching calculus at Tulane in 1957 and taught that course almost every term with enthusiasm and distinction until his retirement at the end of the last millennium. During his tenure at the University of Georgia he received numerous University-wide teaching awards as well as directing several doctoral dissertations and seven undergraduate research projects. He is the author of research papers in number theory and topology and is the author or co-author of textbooks on calculus, computer programming, differential equations, linear algebra, and liberal arts mathematics.